Until his characteristic roving camera peels away and exposes the explicitly theatrical world on which his drama is founded … A world in which screens are lifted unveiling a choreographed procession of people skating on ice; where pulleys and ropes are often visible on the side of the frame; where the camera cranes up to the ceiling revealing a world split between those above the stage and those pirouetting below. Within this world, we are introduced to the eponymous aristocrat, brought to life by Keira Knightley in her third collaboration with Wright. When Anna Karenina begins an affair with dashing Count Vronsky (Aaron Taylor-Johnson), she invites chilly contempt from her dour, statesman husband, Karenin (Jude Law) and widespread contempt from polite society. Is it love or an infatuation? Meanwhile, running parallel to this is the section of Tolstoy’s narrative often neglected by cinematic adaptations: the burgeoning romance between aristocratic landowner Levin (Domhnall Gleeson) and Kitty (Alicia Vikander, from the brilliant Danish drama, A Royal Affair). Shakespeare once declared ‘all the world is a stage’ and Wright has taken that to heart in his new adaptation of Leo Tolstoy’s classic novel. For the most part, he frames the drama within the confines of the stage to send up the artifice of the world Tolstoy himself described on the page, exposing the hollow theatricality of Russian high society. Wright also mines intrigue out of the contrast between the world of the stage and those scenes shot in location in desolate Russia. Such contrasts put us in the characters shoes: what is genuine and what isn’t? Anna herself is most often framed within the theatrical setting, amplifying her crisis of conscience as to whether her feelings are tantamount to love or lust. Levin and Kitty by contrast are very often shot within the ‘real’ world, such is the authenticity of their love. There’s no denying that Wright’s vision is a bracing and intellectual one. It is however a tricky proposition: very often Anna Karenina the film becomes less a drama of societal conventions and more a symphony of clanking logistics. Instead of being swept along by the contradictions in Anna’s heart, we’re very often distracted by the impressive efforts that lift us out of one scene and into another. There’s no denying that Wright’s vision engages both the brain and the senses; however, it simply doesn’t engage the heart. The film works best when the theatrical context is deployed in more discreet fashion. When Law becomes aware of his wife’s infidelity, there is a marvellous moment when he is captured sitting in a chair on-stage, alone, the lights slowly dimming around him. It’s quite telling that the film’s most effective moments are its least ostentatious ones. In such moments as these, the movie’s innovative touches are apparent but we’re also given room to concentrate on the performances, which are for the most part very successful. Knightley has demonstrated in the past that she’s a very fine actress when given the right material, and Anna Karenina is no exception. In-keeping with her previous collaborations with Wright, she’s unafraid of highlighting the steely, unsympathetic edges of her character – the shot of her in a black funereal veil, aloof and alone, is unforgettable. Likewise, Law also demonstrates that he’s at his best when assaying cold, creepy characters (The Talented Mr Ripley; Road to Perdition et al). In this, Karenin is a compelling creation, a man who shuts himself off from the world and expects his wife to follow suit. Taylor-Johnson has the duff role as the dashing cavalry officer, defined more by his moustache than his personality but he’s convincingly dashing. The background is studded with a plethora of exemplary British actors including Matthew McFadyen, Kelly McDonald, Olivia Williams and Emily Watson but, denied a substantial shot at the spotlight, they’re swallowed up in the endless succession of whirling camera moves and shifting scenery. It’s left to Gleeson and Vikander to provide much of the film’s heart: their clear, unfussy chemistry benefits from some of the movie’s least bombastic framing and strikes a humane chord. Still, it is a commendable vision and at least has the guts not to go down the masterpiece theatre route. 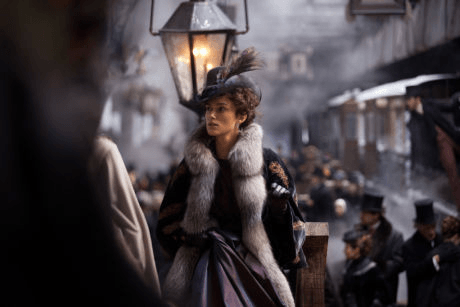 Even if it doesn’t truly move, Anna Karenina has enough good performances and distinctive ideas of its own to stand out from the pack.